The Insurance Institute for Highway Safety (IIHS) — representing a consortium of auto insurance companies and other stakeholders — routinely tests most new vehicles, assigning each with a score based on crashworthiness and other factors. Such factors include front crash prevention and lighting systems, what can help prevent accidents in the first place. 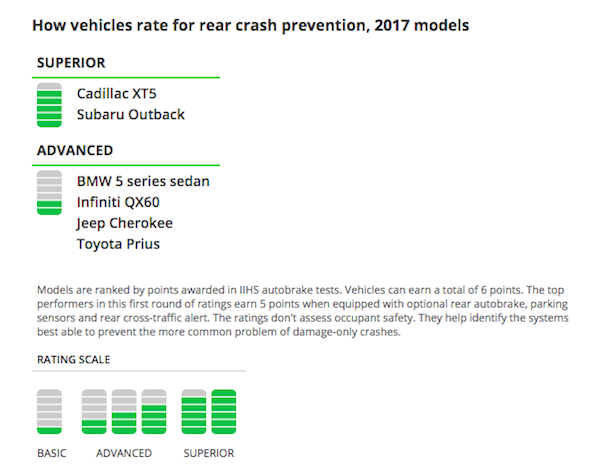 Thus, you can now add rear crash prevention to the mix, specifically rear autobrake systems, as the IIHS has begun testing them.